Is she just crazy or am I a bad friend? Thread: Is she just crazy or am I a bad friend? Every couple of months, Rockchick26 likes to dust off her enotalone profile and spar. So I take it none of you ever make posts of your own then? I hate fighting, if I enjoyed this, I wouldn't be bothered by me and my friend fighting! Your comment makes no sense. I don't come in here every few months for the sole purpose of doing anything, I just wanted to vent and get suggestions on the situation which is what forums are for. Like I ask every time and nobody seems to answer me, why am I being judged for using a forum with it's intended purpose!? It shouldn't even be called eNotalone, I always feel more alone after posting in here with everyone judging me and not listening to me. Just as you all think I have a pattern of "arguing", you all have a pattern of taking my first post and mixing it with all my past posts (as if writing a tell-all book about me) and judging me without taking my clarifications into account. I think this is the last time I will be posting in here. I also post in other forums and in many groups on FB and never get this kind of response. If I hurt your your feelings, I apologize (genuinely). That wasn't my intent. It's just that any time I see one of your threads appear, I know what's going to happen. Is it possible that maybe when you post, you expect to get attacked? So, when people respond, you assume it's an attack? Because in the first few responses on this thread I didn't see a lot of attacking, but I do see a lot of defending. That's sort of changed once accusations started flying. But it didn't start out that way. I do think you like the mental wrestling match, whether you are willing to admit it or not. 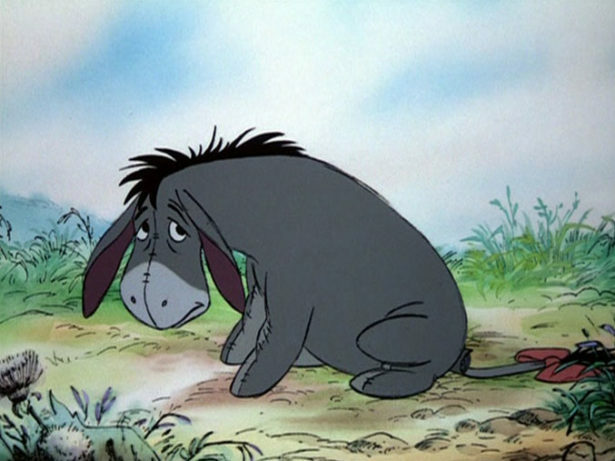 I don't think I was a huge Winnie-the-Pooh fan when I was little, but Eeyore was my favorite for some reason. Him and that pink bow on his tail. She had a previous thread where she wanted a low effort job without schedules if I recall correctly and asking how she could achieve it. It panned out into a huge thread where people were giving suggestions and she was dismissing every one of them and arguing against every one of them like she usually does. Similar to this thread and the ex boyfriend thread.